For the longest time, when someone would ask me “What’s a good first cookbook?”, I would recommend Julia Child’s The Way To Cook. Julia and I were having a thing in the 90’s and I want to help her out with book sales. As my personal interests shifted towards books more focused on technique, new recommendations emerged. 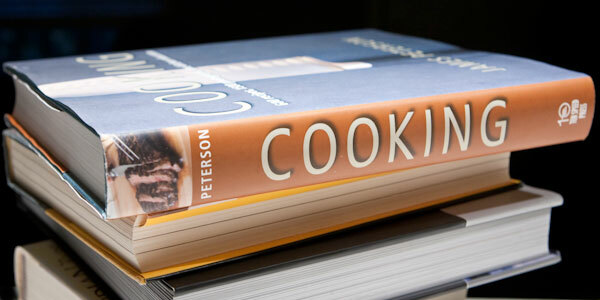 Now, I’m a fan of Cooking, by James Peterson. It has the right balance. First, the basics: knife sharpening, boning fish, stocks, etc. Then, a wide variety of commonly prepared items: salads, salsas, roasts, pies and many more. Plus, it’s written in a comfortable tone, like your aunt dispensing a family recipe. 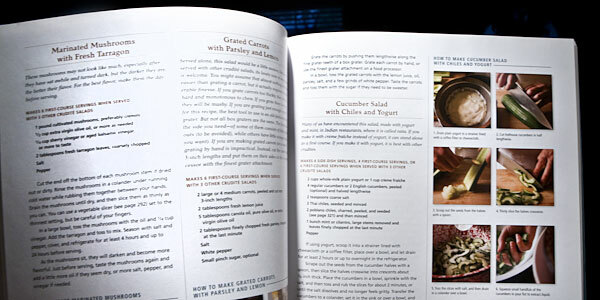 What bugs me about many cookbooks is that they either don’t explain all you need to know to successfully pull off the item you are creating or they imply that some sort of magic is needed. Mr. Peterson gives you plain talk. Cooking for over 40 years, and teaching cooking for the bulk of it, has given him plenty of time to weed out what works and what doesn’t. “Cooking is based on doing lots of little things correctly without taking shortcuts.” That is about the clearest wisdom I have heard on the subject.